Israeli security officers look at the site December 21 where a rocket fired from Gaza landed in Kibbutz Zikim, southern Israel. NEW: Israel says it targeted a "terror activity center"
Jerusalem (CNN) -- Four Hamas militants were injured Tuesday in an Israeli airstrike, Palestinian medical officials said. The Israel Defense Forces said it targeted "a Hamas terror activity center in the southern Gaza Strip. A direct hit was confirmed." The airstrike was in retaliation for rockets fired from Gaza into southern Israel over the past week, the Israeli military said. On Tuesday morning, two people -- a teenager and a truck driver -- were lightly injured when a rocket landed near a kindergarten in Kibbutz Zikim, the Israeli military said. The rocket was a Qassam, the crude, homemade projectile used by Palestinian militants in Gaza. The four militants were injured in the Tuesday airstrike on a Qassam rocket site in Rafah, the medical officials said. Overnight Monday, the Israel Air Force said it attacked seven sites in Gaza. Three Palestinians were wounded in the attacks, according to Palestinian medical officials -- one, a Palestinian laborer whose leg had to be amputated after an airstrike on a yogurt factory in Gaza, and two Hamas militants injured from shrapnel in another airstrike on a Qassam site. 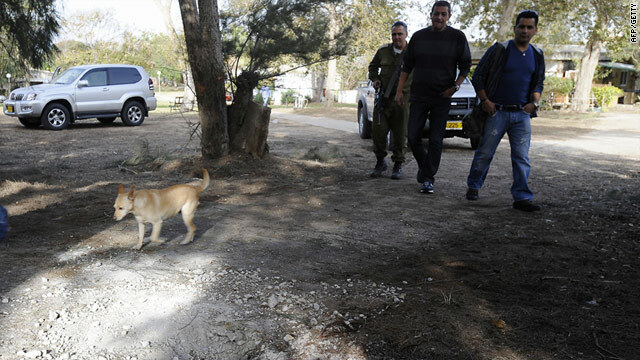 Since Monday, 15 such projectiles have landed in Israel, Israel Defense Forces said. Since 2010 began, "over 200 Grad missiles, Qassam rockets and mortar shells have been fired from the Gaza Strip into Israeli territory." CNN's Michal Zippori, Kareem Khadder and journalist Ibrahim Dahman contributed to this report.